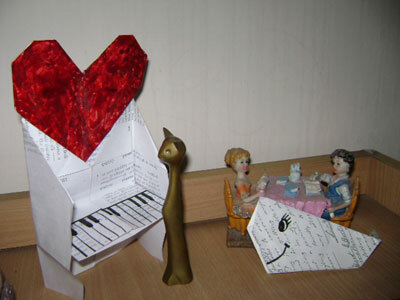 Here are origami piano photos that have been submitted by our readers. Check them out! 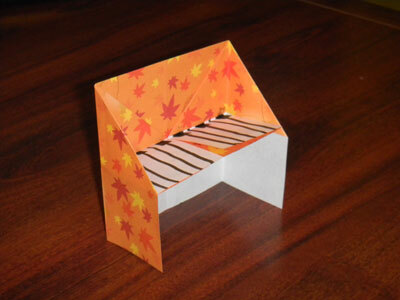 From Jesi of Huntington Beach "This was very easy to make!!!! I colored it and I'm giving it to my grandpa. 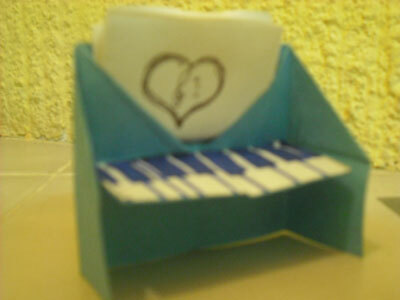 He loves pianos!!" Jesi - I hope your grandpa likes it! 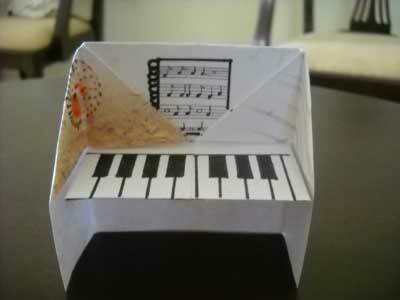 From Antonio in Mexico City " I love pianos. 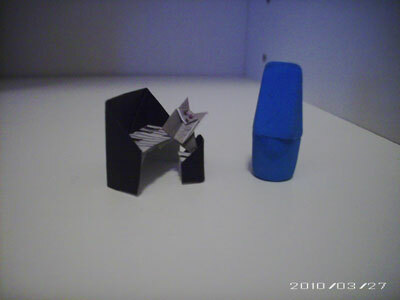 This is my all-time favorite origami piece. " 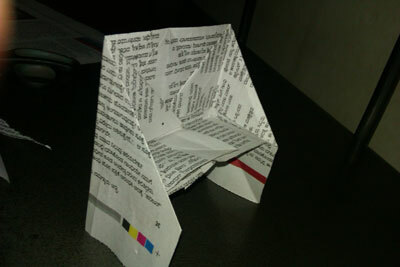 From Scott in Bradenton " I made this when I was looking for something to do! 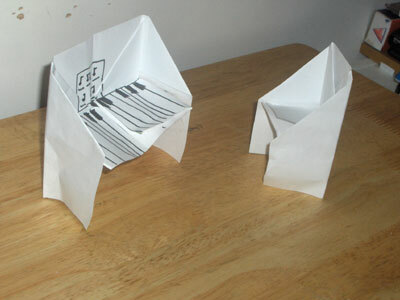 An origami piano. 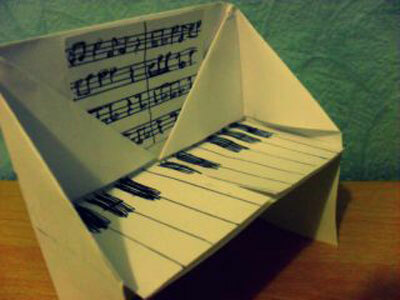 Made with white copy paper! " From reader in Clarksville "This was so much fun!" 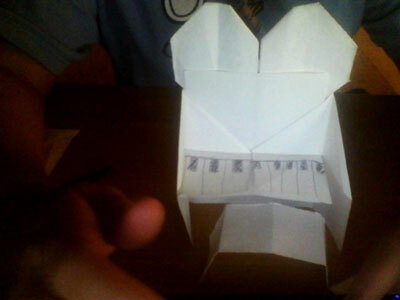 From Estefania in Houston TX " This is an origami piano built from your website instructions. I was very happy while playing on it." 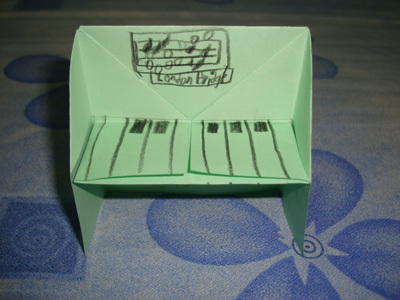 From Daniella in Flushing " this origami is perfect for my piano teachers birthday! " 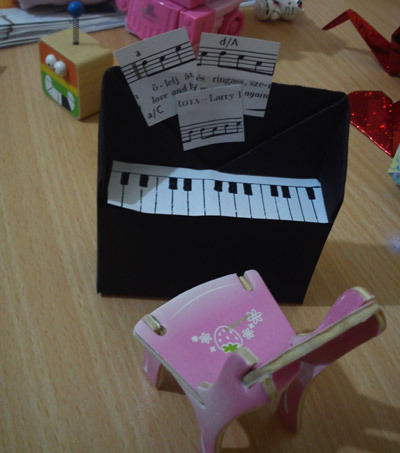 From Michelle in Davao City " My son was able to do this origami piano all by himself ^-^ "
From Re'an in Malaysia "Origami Piano." 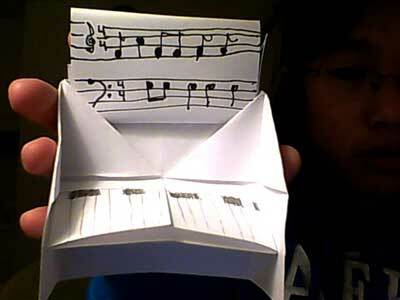 From Murielle in Ajax " This here that i am giving to you is a origami for kids piano. 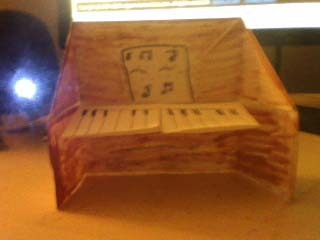 I did something different with the piano. 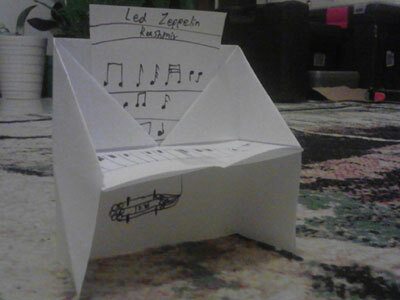 I included a music sheet which can go between the two triangles and the back sheet. 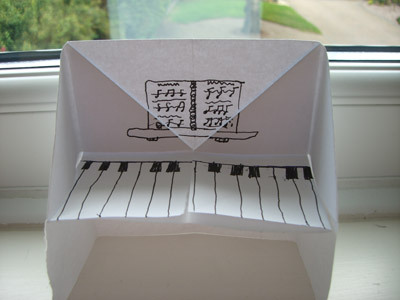 No its not coloured like a real piano but it has music sheets. 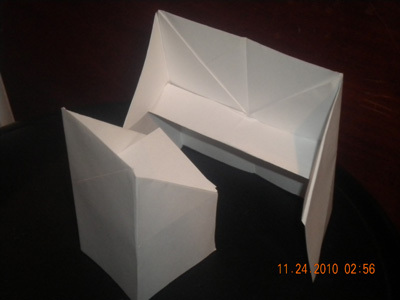 I did this from printer paper that i made it into a square if i had origami paper i would have used it but since i dont than i decided to use printer paper. 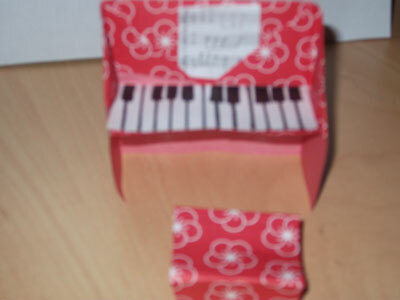 I started doing origami just a few weeks ago and I really enjoy it I have tried every single origami kids but some of them i just cant do but i keep trying so i can succeed. Like the saying i always follow Try and fail but dont fail to try. I believe that everybody should follow that quote because. I see people try once cant do it and give up. " 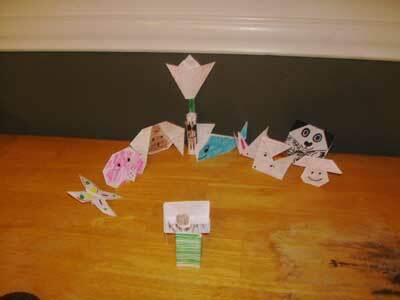 From Cayla in Dalton " I used this site to make a whole group of origami creatures! It was fun and simple. 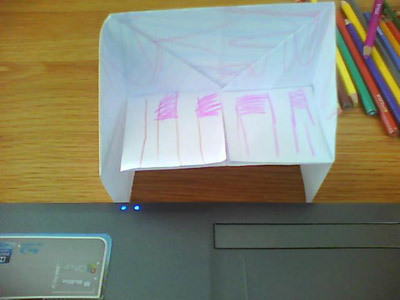 I set them all up, so they could listen to the little paper stick man play the piano! 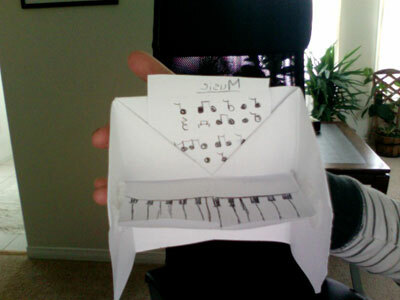 =) "
From Emily in Portland " This is a photo of my beautiful piano. 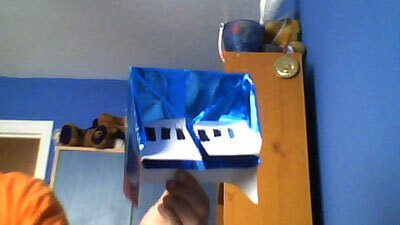 I made it from regular card stock paper. 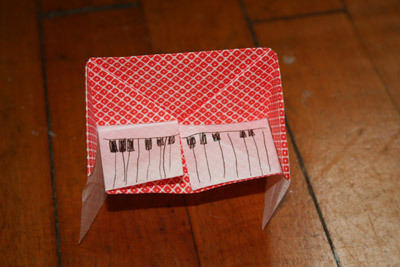 It makes a wonderful addition to my regular-sized piano! 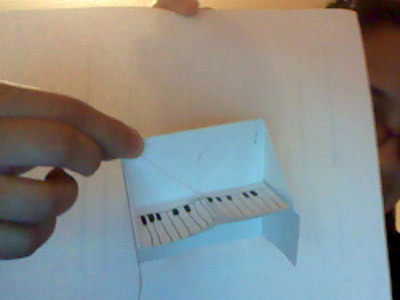 I have also made a little sheet of music for it. " 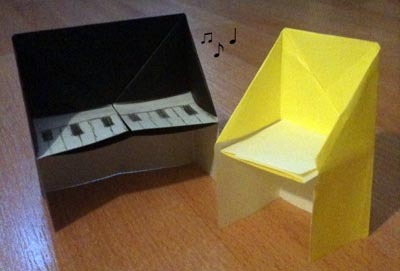 From Jo in Northamptonshire " This origami piano was really fun and easy to make! 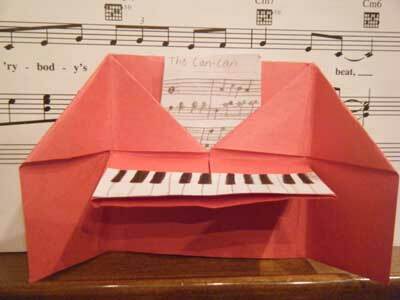 =) "
From reader in Canada "Origami Piano." 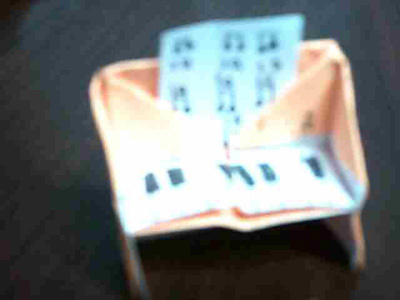 From Taylor in Raymore " Super tiny fox in a super tiny chair playing a super tiny piano!!! I used a pencil eraser to compare size. " 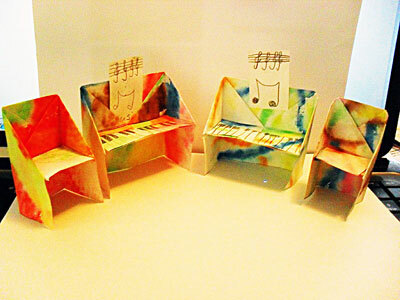 From reader in Winter Park " Tye Dye origami piano and chair. This was so much fun! 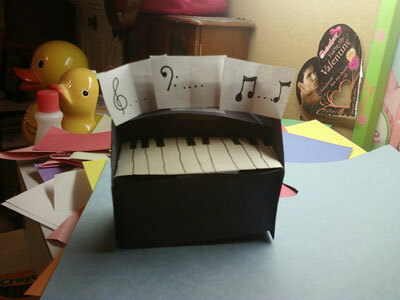 :) "
From Alex in Chicago " I love making origami things and I love pianos too! " 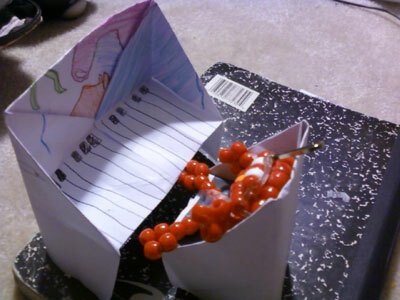 From Katie in England " This is so easy to make! 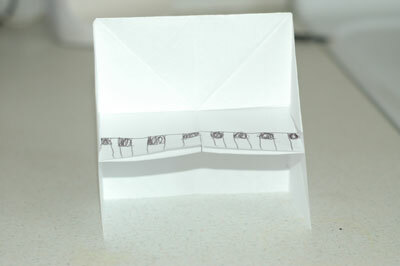 I made a chair to go with it, and I am giving it to a friend! " 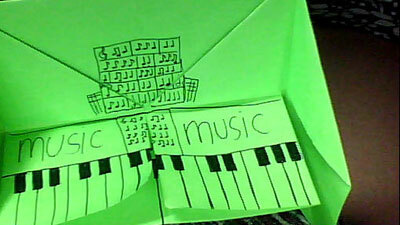 From Gabriel in Phoenix " this is my origami piano i think its awesome... thanks! your reader Gabriel "